Smart technology is playing an increasingly central role in both business and private lives and the digital revolution is making its way into the locks business. Once the preserve of commercial offices or large multiple occupancy buildings, affordable electronic door locks are becoming more popular as a “smart” security solution for both homes and businesses. Customer’s access control needs can vary widely, from just a few users of one lock in a residential or small business property, through to ever changing multiple users of multiple locks in a large commercial facility or hotel. The rise in popularity of short term home/holiday letting has led to a greater demand for flexible multiple access systems that allow the owner to quickly and easily change access rights, often at a distance from the property itself. Ever at the forefront of security product innovation Burg-Wächter continues to develop the latest in electronic door locking systems that adapt to customers’ changing lifestyles. Customers won’t want to pay for capability beyond their needs, so rather than producing a one size fits all system, Burg-Wächter has created a range of three tailorable systems which together cover all of the most popular installations. Most electronic door locks come with one or more means of entry, such as keypad, biometric (fingerprint), Bluetooth or RFID. 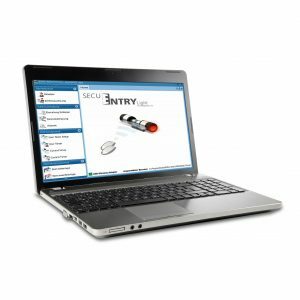 The entry level “secuENTRY Easy” system combines keypad, biometric fingerprint reader and Bluetooth technologies into one easy to use system. The illuminated keypad is programmable with up to 50 different users with a choice of one million different codes for high levels of security. There is also the option to include a biometric finger scanner, capable of recognising up to 24 different prints for added convenience. The keypad provides IP65 weatherproof protection against dust and water, making it ideal for doors inside and out. T he power of Bluetooth allows the lock to be activated via the Burg-Wächter smartphone app, which is available on both Android and iOS. 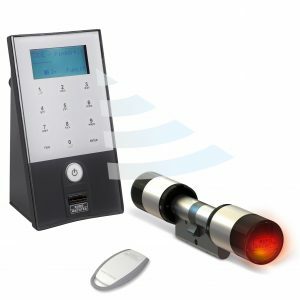 At the top of the range, the “secuENTRY Pro” is a fully scalable version of “secuENTRY” that has been specifically designed for hotels and larger commercial installations with up to 2,000 users. Dedicated management software allows time controlled access across multiple locks and is compatible with fully automated payment and check in/out systems. The last 2,000 events are also recorded and viewable, which is useful for security auditing requirements. Offering all the functions of the “secuENTRY Easy” system, the next step up is the “secuENTRY” professional installation system, ideally suited for locksmiths. The stylish compact cylinder adds the flexibility of RFID access in the shape of passive transponder key fob. One of the biggest deterrents for customers thinking of switching to electronic door locks is the expense and inconvenience of having to change the whole locking mechanism including the housing. Burg-Wächter’s “secuENTRY” ranges overcome this hurdle as the cylinder is designed to be a direct replacement for standard Euro cylinders, cutting installation time and cost by leaving the existing lock housing in place. The length of the electronic cylinder is adjustable up to 59/59mm, making it suitable for a wide range of door thicknesses up to 130mm. Another installation consideration is power, which can be particularly challenging to route to the inside of the door. 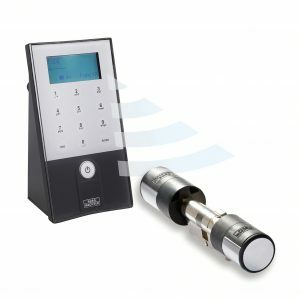 All “secuENTRY” systems avoid this issue as both the keypad and cylinder are battery powered, and have a wireless operating range of up to 4m. Once activated, the electronics release the locking mechanism inside the cylinder allowing the knob to be turned manually. This method of opening the door keeps power consumption to a minimum, meaning that depending on setup, the system has a battery life of up to four years.